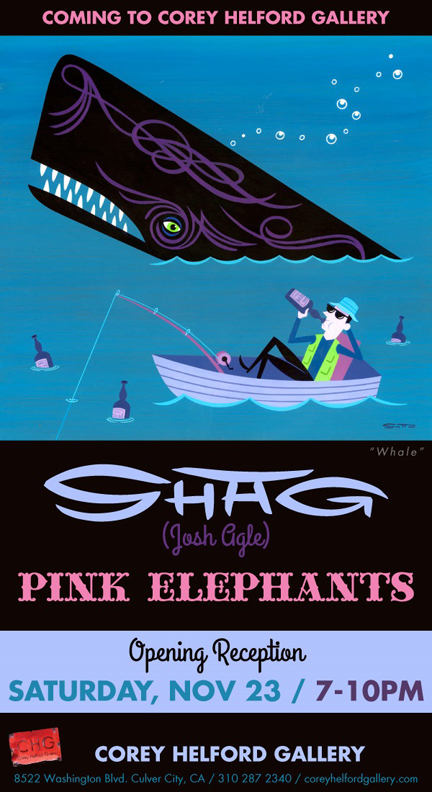 Following the success of Autumn’s Come Undone in 2009 and Animal Kingdom in 2012, Josh Agle returned to the Corey Helford Gallery in Culver City, California for his third solo show in 2013. 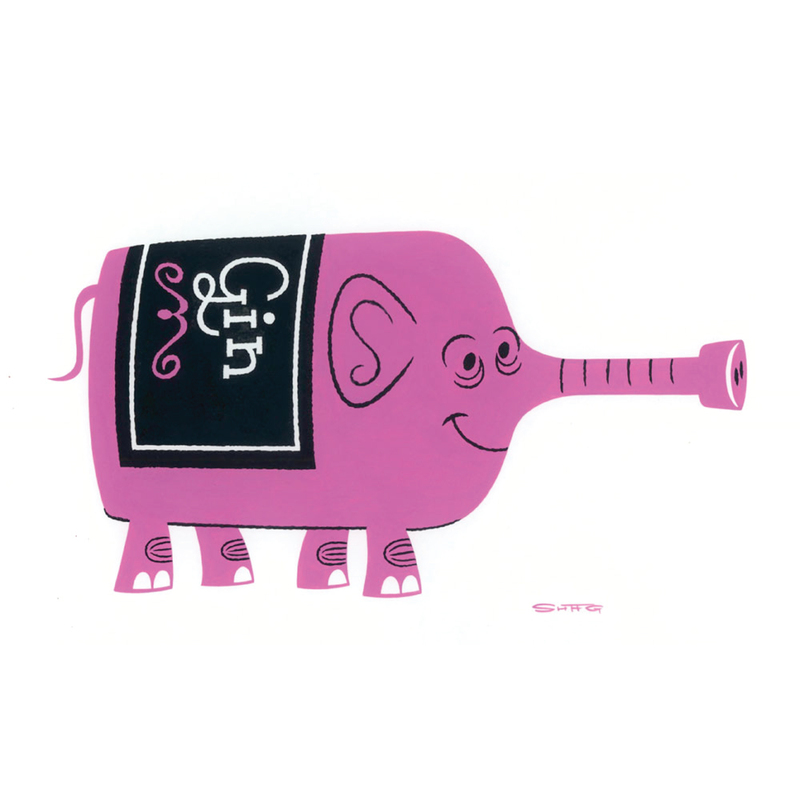 The Pink Elephants exhibition was held from the 23rd November 2013 to 7th February 2014. 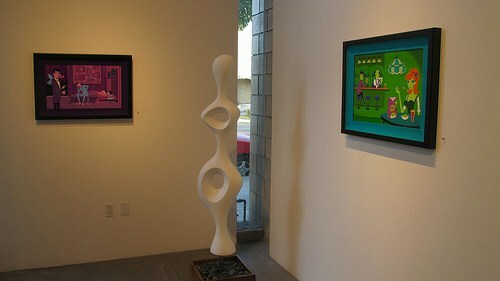 The exhibition included twenty-four original paintings plus a sculpture and two limited edition prints. 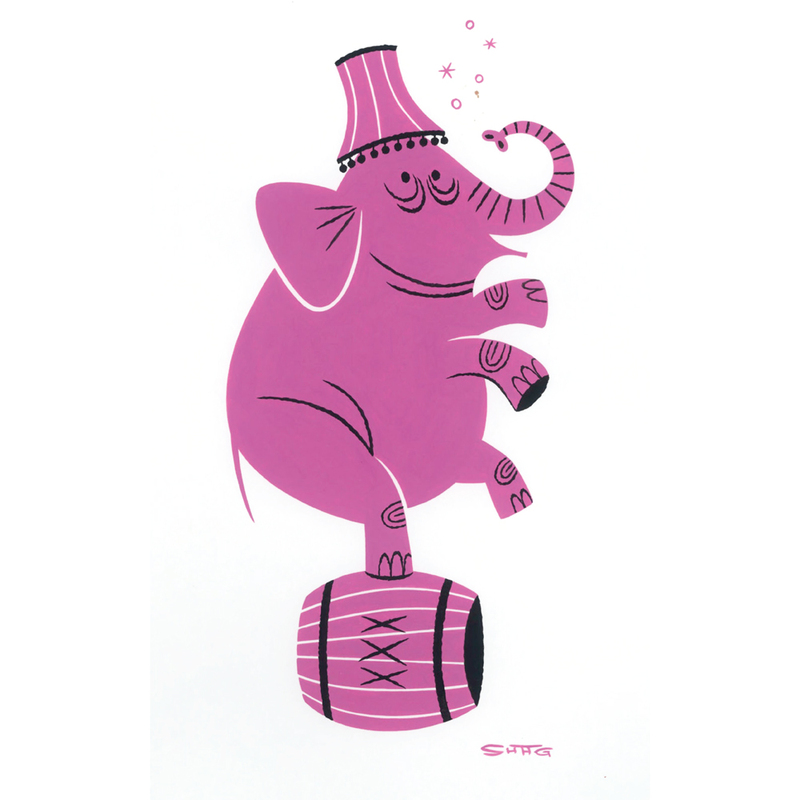 The expression Seeing pink elephants is a euphemism for alcohol-induced hallucinations and dates from the early 20th century. 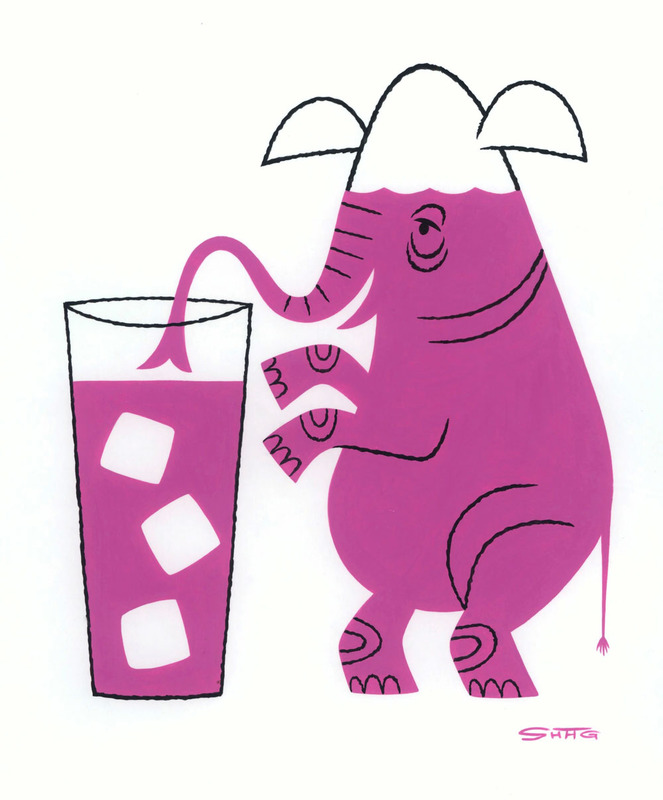 In the 1941 Disney animation, Dumbo accidentally drinks water spiked with champagne and hallucinates pink elephants on parade. 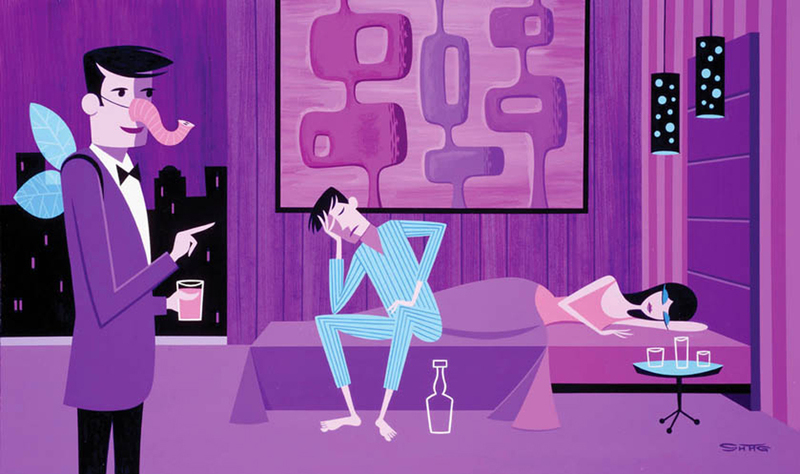 Being uncharacteristically descriptive, Josh Agle explains “I used alcohol as an aid to create art and as a means to escape the expanding responsibilities of a successful art career. I pursued the variations and varieties of drink like the most dedicated stamp collector, or fisherman might devote himself to his hobby. 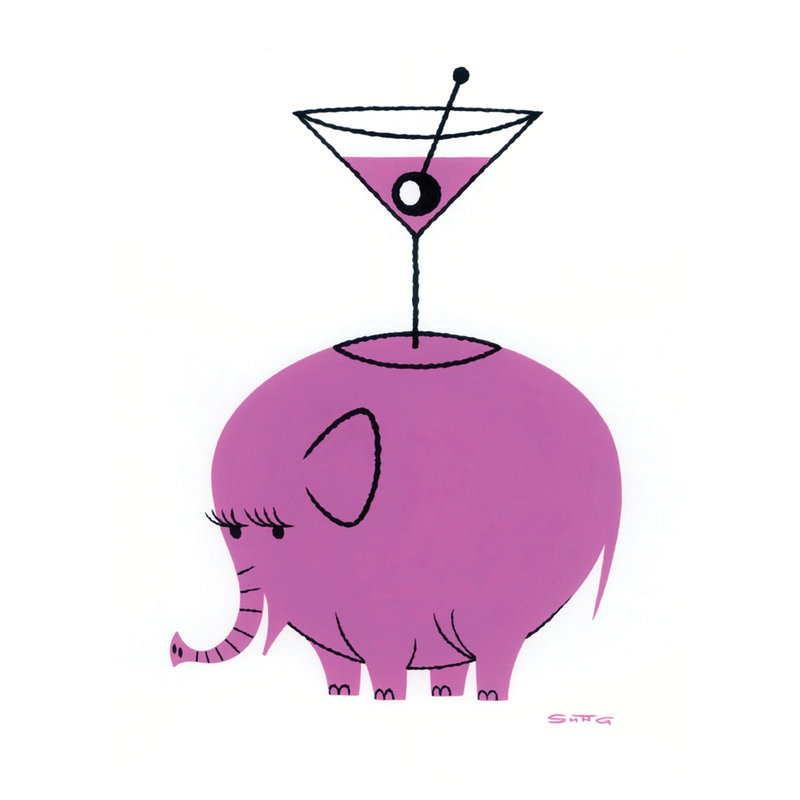 Because I was a well-known artist well known for the glorification of cocktails, I drank for free in many bars and restaurants. Painting became something I did between binges. The benders expanded. At some point, the end of one bout of drinking met the beginning of the next. I stopped drinking the day I realized I hadn’t lifted a paintbrush in a week. I put my hobby on hold, cut myself off, yelled “last call,” and haven’t had a drop in months. I’m not declaring I’ll never drink again – I cherish my rum too much. But I will give it a long vacation. I do miss it, like one misses a close friend who’s moved to London. In the meantime, I can make paintings about drinking – paintings that embellish, rebuke, condemn, and extol it”. 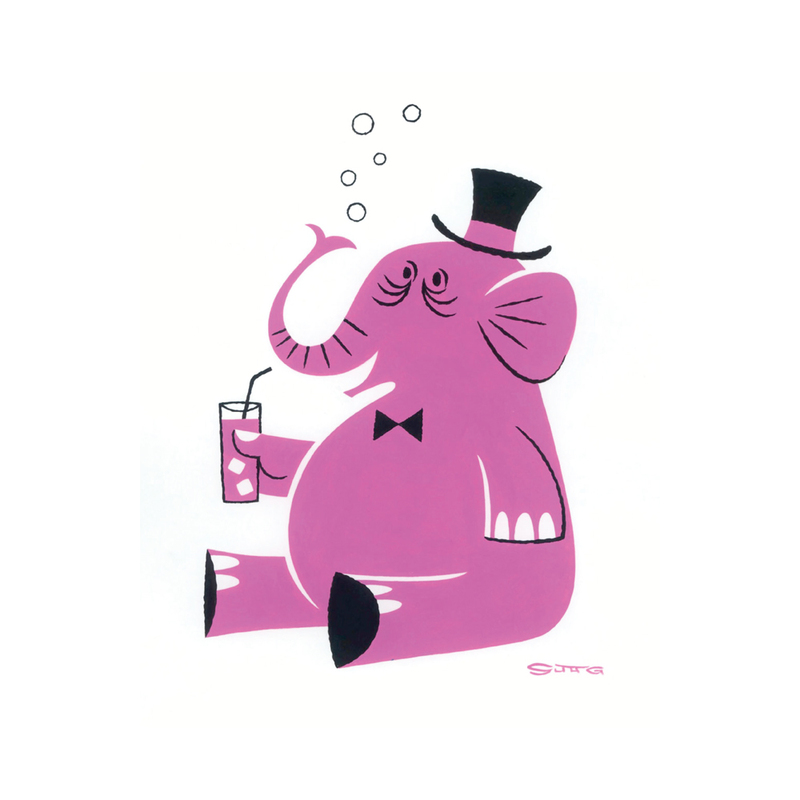 The first twelve original paintings shown are the acrylic on paper series of pink elephants. 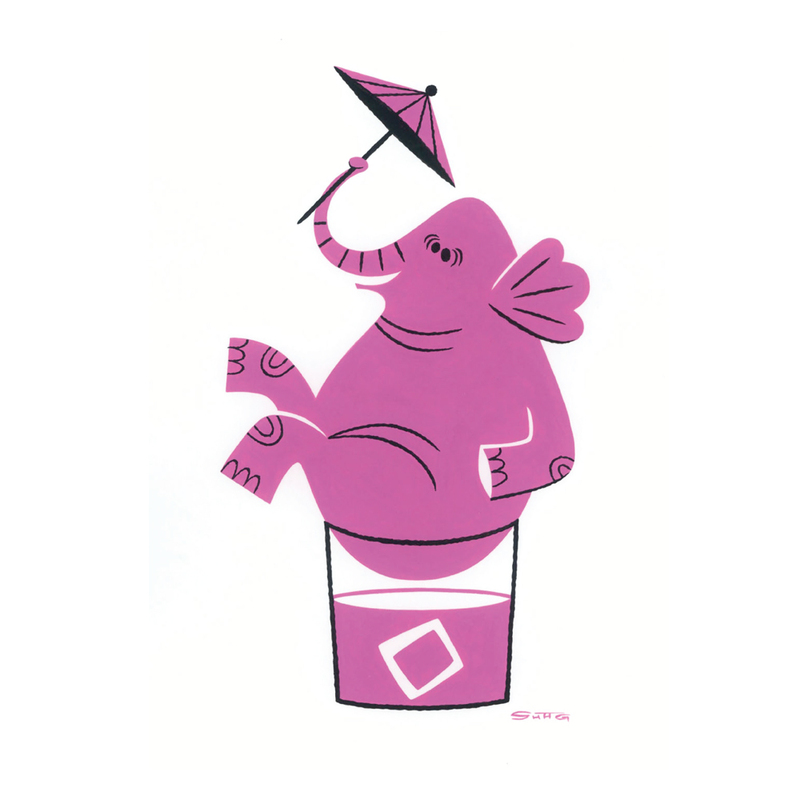 Each of the twelve pink elephant paintings measures 10″ by 16″ and cost $2,200 USD. 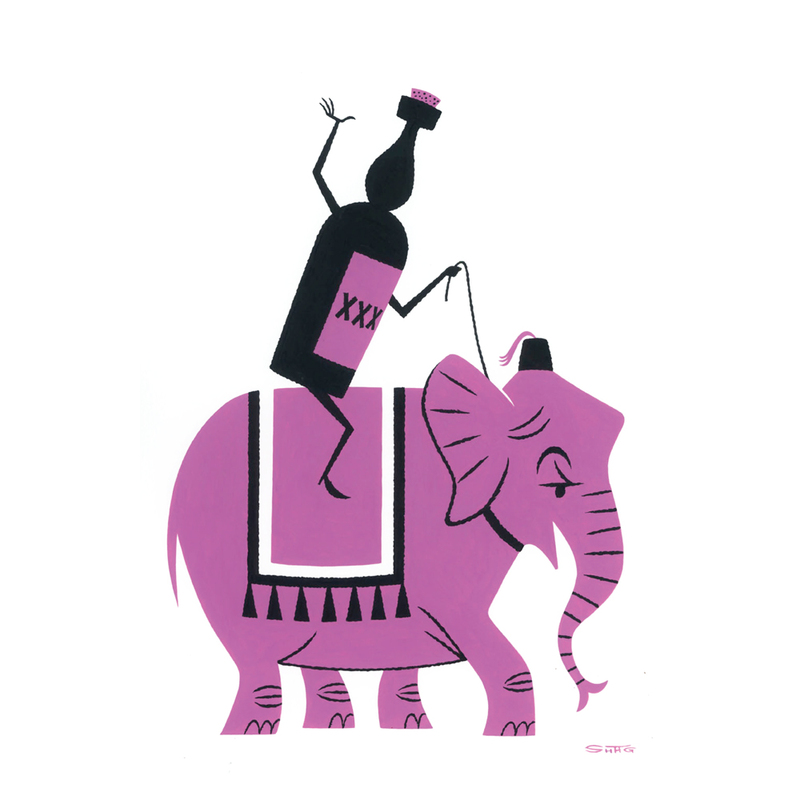 The theme of intoxication continues at the Pink Elephants exhibition with the main set of twelve narrative paintings. Shag has written before regarding his love of large bottles of alcohol. Girl with Magnum shows a young girl and her cat with a 1.5 litre bottle of whiskey (although to be honest, it looks a lot larger than a magnum). 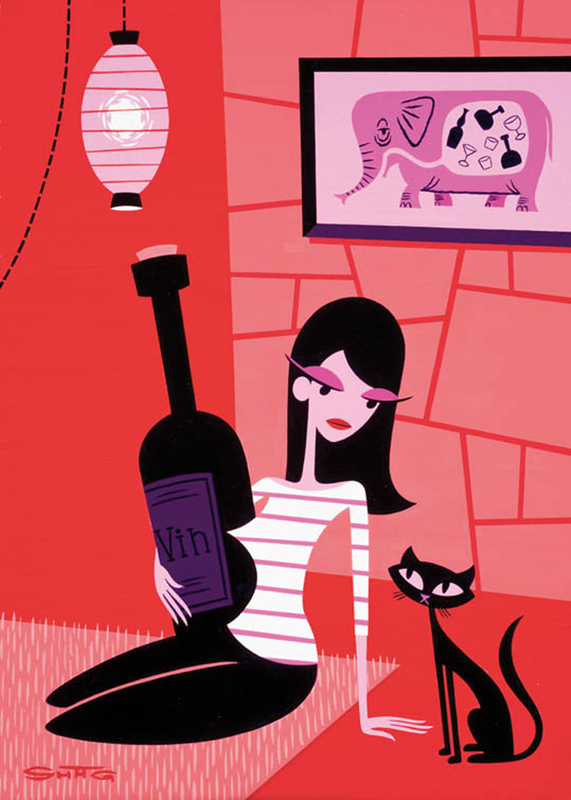 The same girl and cat appear in Girl with Nebuchadnezzar with a 15 litre bottle of wine. 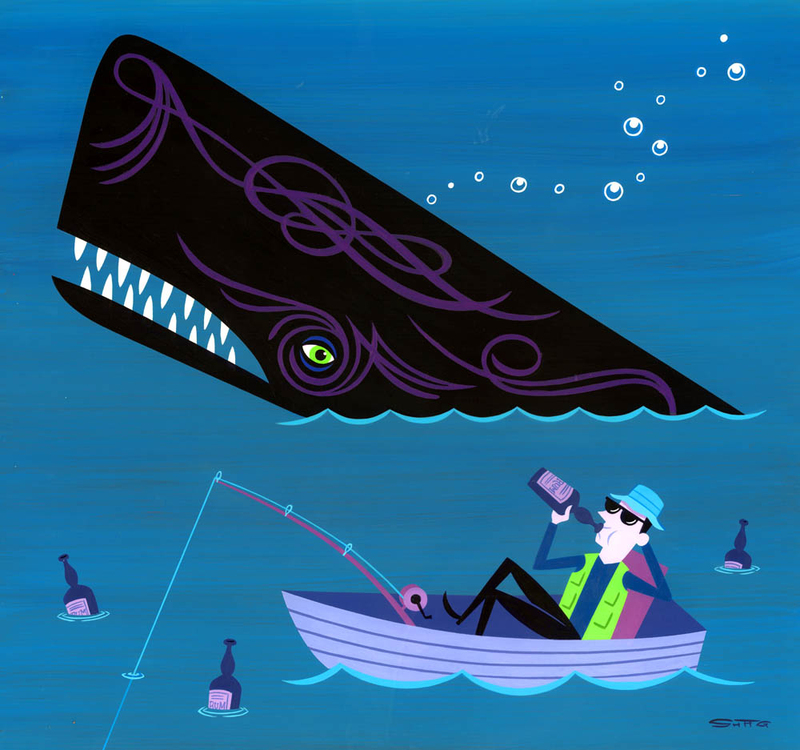 In The Fuzzled Fisherman, an intoxicated fisherman drinks rum whilst in the background a pinstriped whale (reminiscent of the 2010 Ambergris exhibition) breaches. 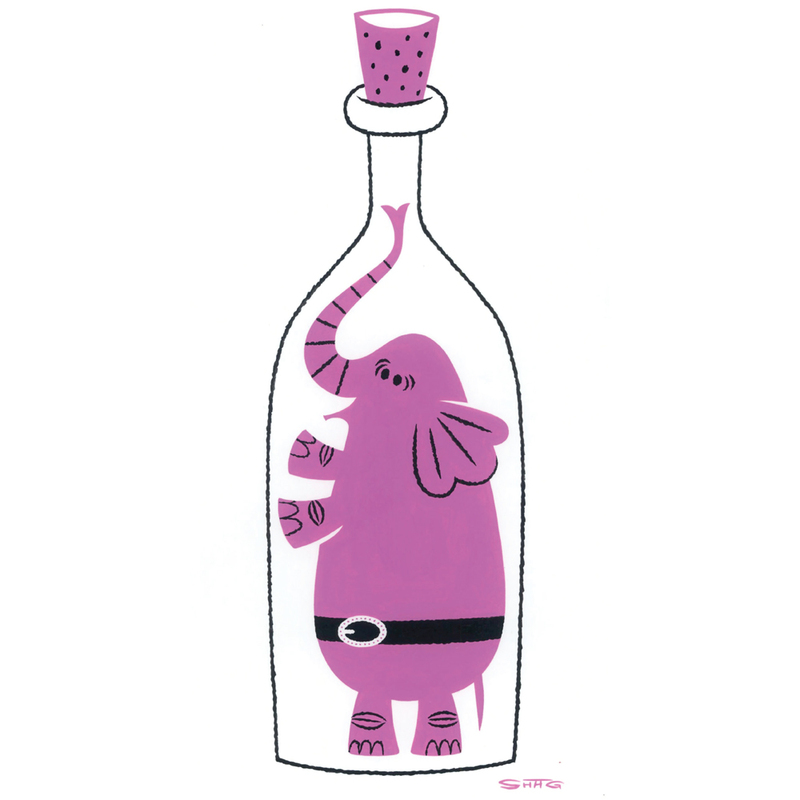 In Office Politics, an office executive is entertained by a pink elephant glove puppet whilst a jealous co-worker approaches concealing a broken bottle. A black mini-phaedra sculpture appears in the background in black, even though they were only later produced in white or red. 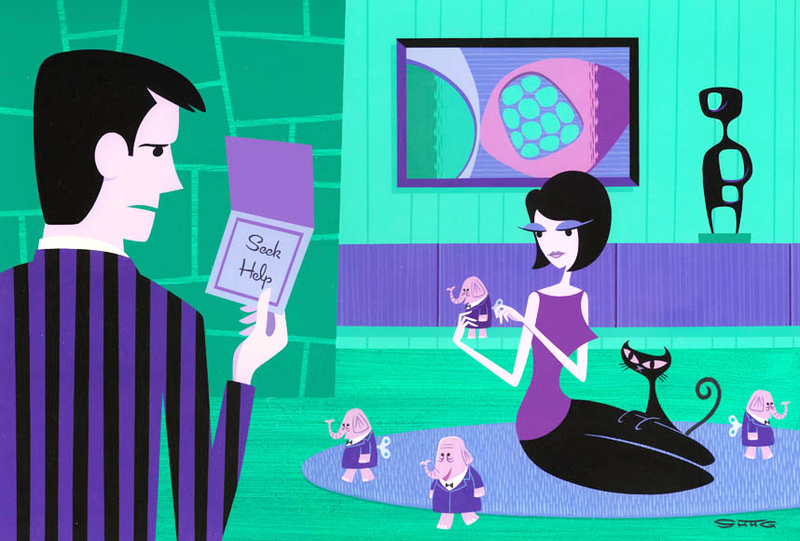 In Seek Help, a main in a pinstripe suit reads a card whilst a lady winds up pink toy elephants. A cyclops sculpture appears on a long credenza in the background of the painting. In The Final Guest, a late staying guest wearing wings and an elephant nose points at a hung over man sitting on the bed. 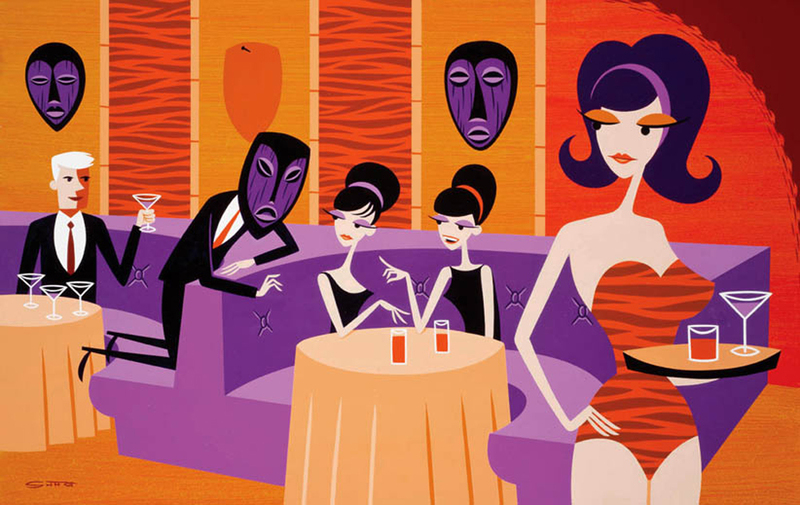 In The Four Martini Lunch, lunching workers happily play with a tiki mask from the wall, whilst a bemused waitress looks on. 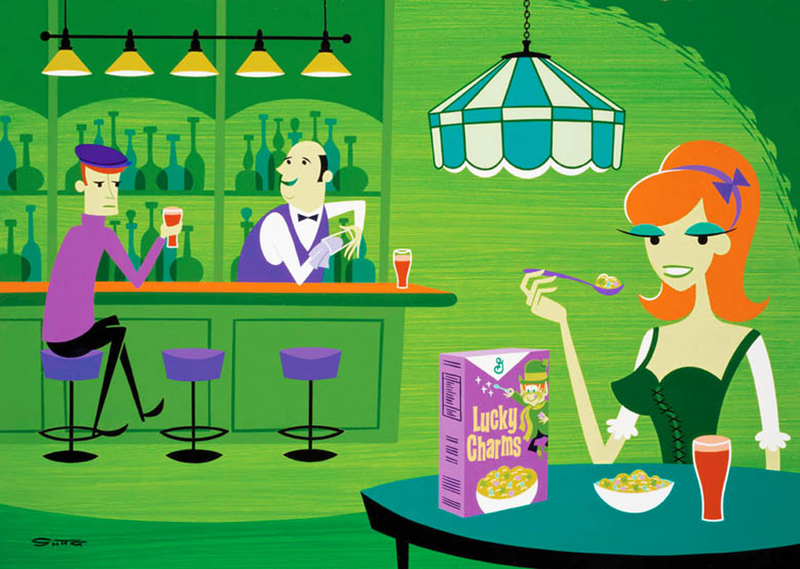 A costumed lady eats her cereal in Her Lucky Charms, presumably in an Irish bar. 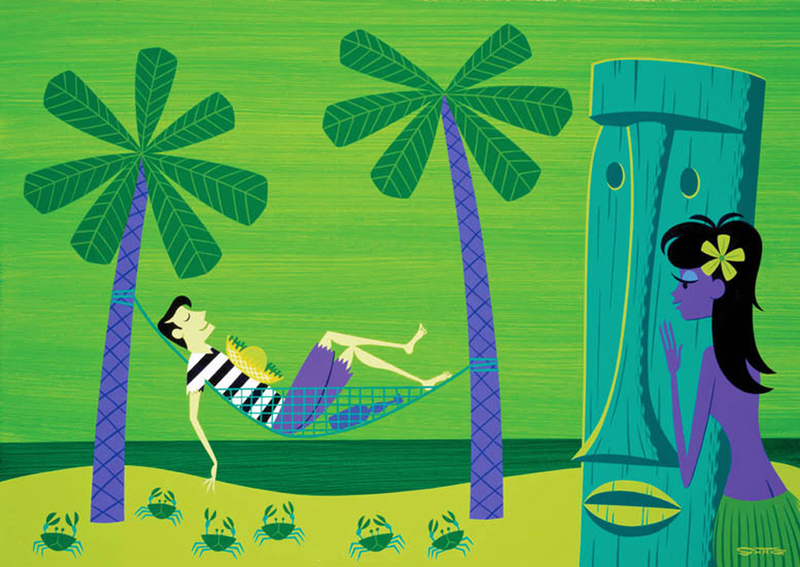 A man sleeps in a hammock (alongside a bottle) whilst being watched from behind a nearby tiki (or possibly moai). The large Eight Shades of Drunk painting includes eight partying adults, all wearing lamp shades on heir heads. 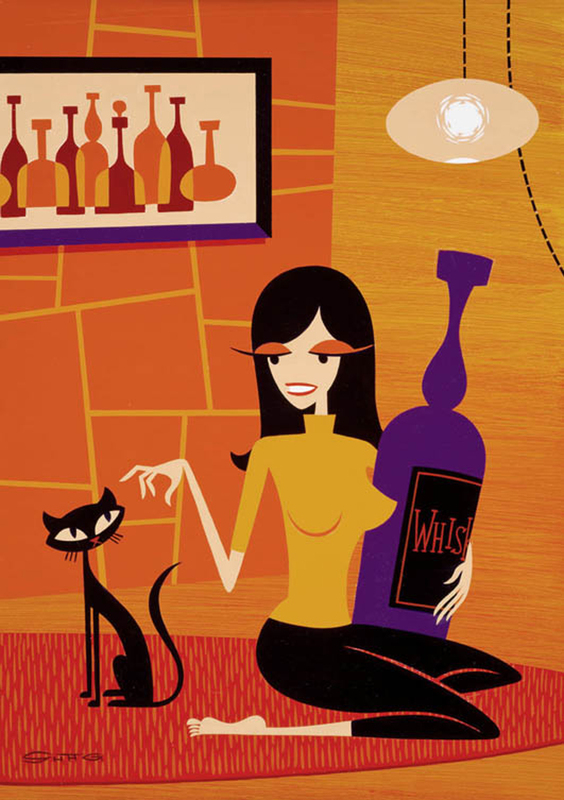 Along with the puntastic title is a great mid-modern interior with flowing fountain and two confused white cats. 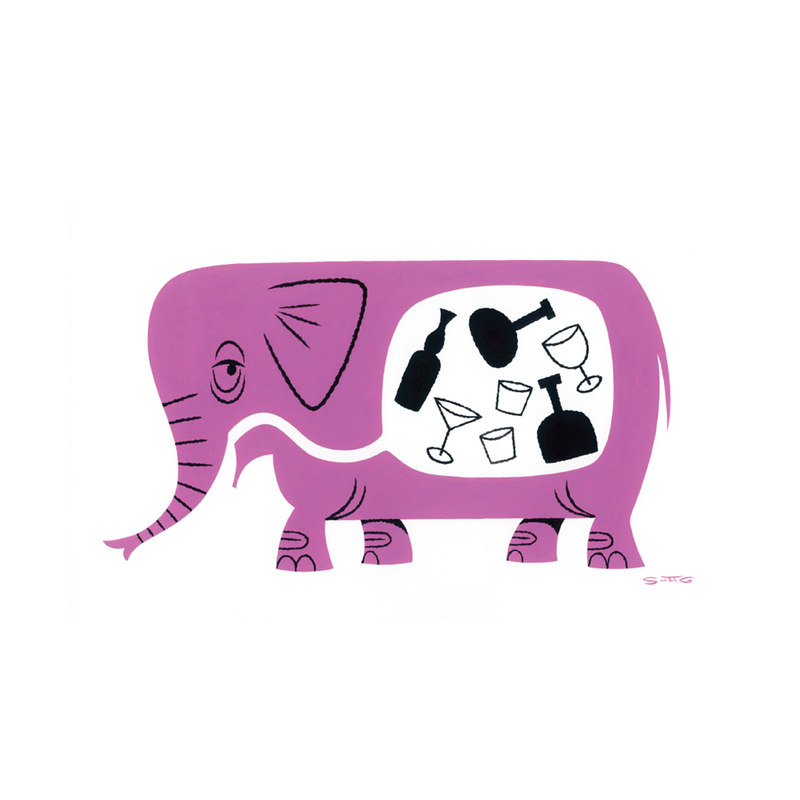 The Ensuing Elephant is a huge painting showing a happening gathering in a beautiful mid-century house. 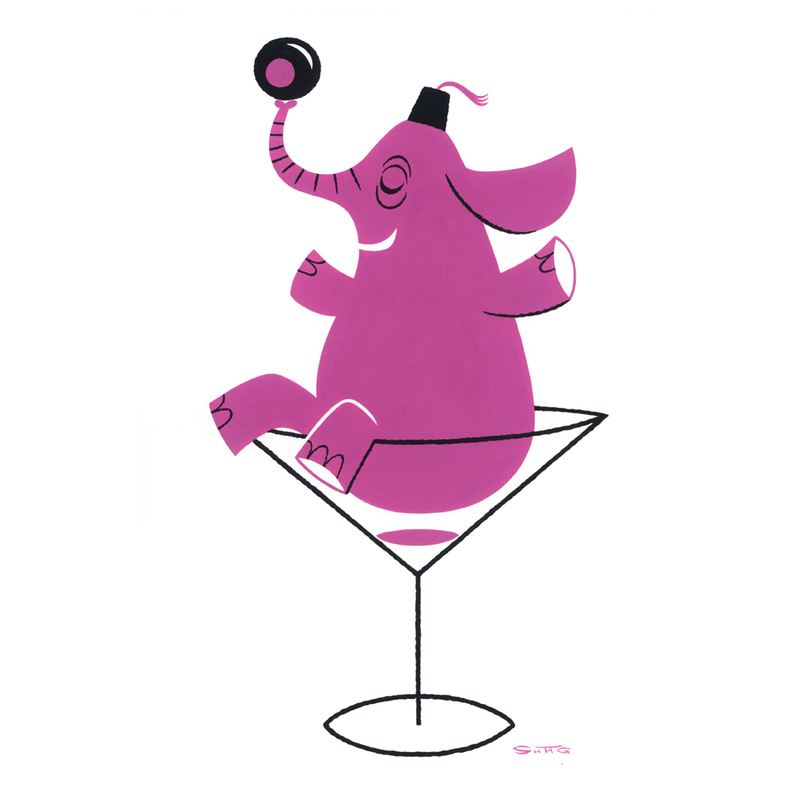 The picture seems to represent the Peter Sellers’ classic 1968 film The Party. 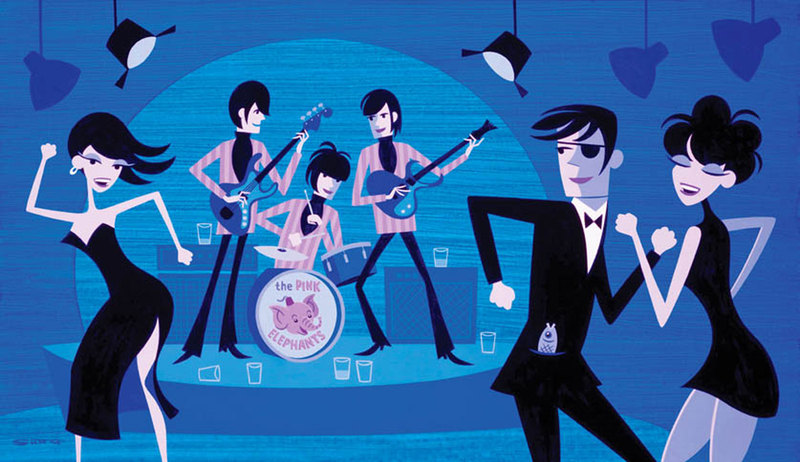 In the picture Ladies and Gentleman, The Pink Elephants – a crowd dances to the Beatles-like band ‘The Pink Elephants’. 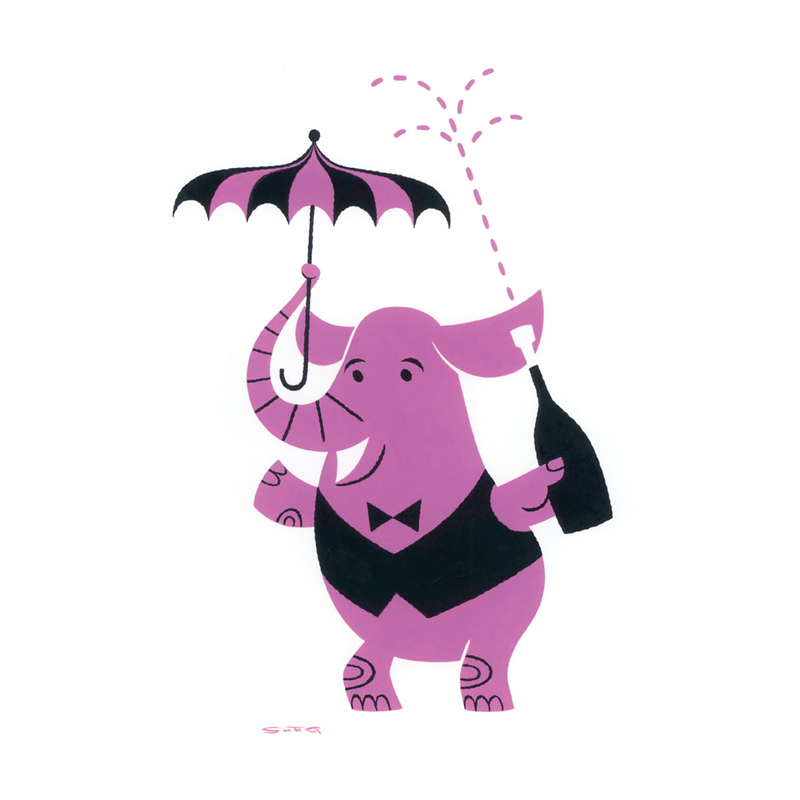 The Phaedra sculpture was also launched at the Pink Elephants exhibition in a limited edition of 100 pieces. This is the first sculpture released by the Mod Fab Group and is sized 60” high with a diameter of 14″. Each sculpture is hand-made from thick, polyester resin composite and is suitable for indoor or outdoor use. Phaedra has an inscribed stainless steel ID tag, a certificate of authenticity, and includes an exclusive serigraph print. The sculpture is structurally integrated with an 8” long by 1.5” diameter stainless steel pole protruding from the bottom for fitting. The pole enables the sculpture to be installed on a free-floating stand, a standard umbrella stand, a buried standard umbrella stand or embedded in concrete. The print included with each sculpture includes a self-portrait of Shag at a blank canvas. 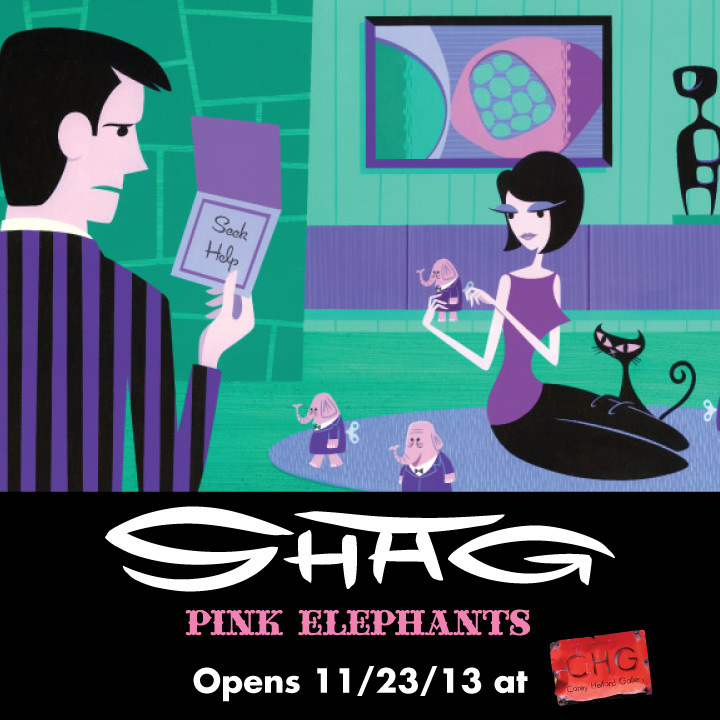 Shag sketched a unique picture into the blank canvas on each print, effectively making this original art. 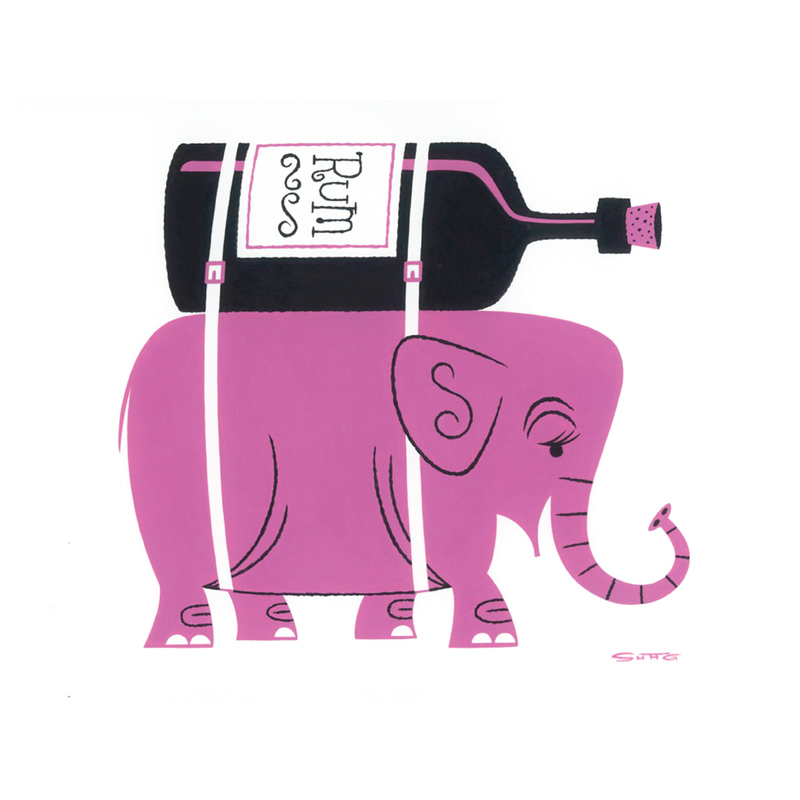 The limited edition 12-color serigraph print E is for Elephants was released at the Pink Elephants exhibition, sized 12 x 14″, in an edition size of 250 and a cost of $150 USD. 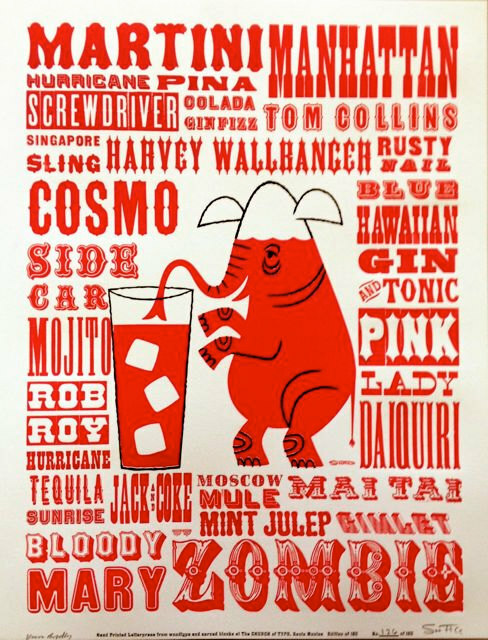 Shag collaborated with letterpress designer Kevin Bradley on the font-based print 29 Drinks, produced in a limited-edition of 150 copies for $100 USD. 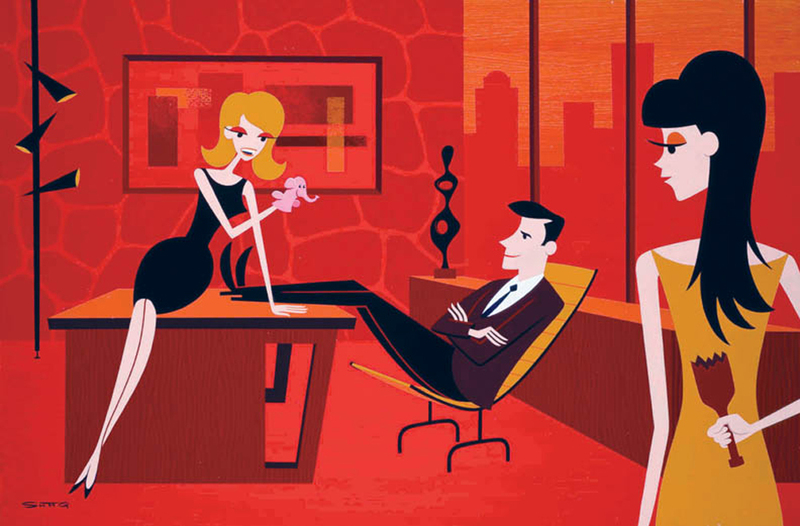 Printed on fine art Lettra paper, the images are sized 17” by 22”, and are signed by Josh Agle and Kevin Bradley.